The state of Oaxaca (pronounced “wa-HAH-ka”) is one of Mexico’s richest states in terms of history, culture, archaeology, and ecology. Oaxaca was home to Benito Juarez, originally a servant-boy to an affluent family, and the man who would become Mexico’s first president as well as one of Mexico’s most revered historical characters. When the Spanish settled here during the 16th century, Oaxaca grew into a semi-prosperous colonial city; the most populous and important center in the south of Mexico. 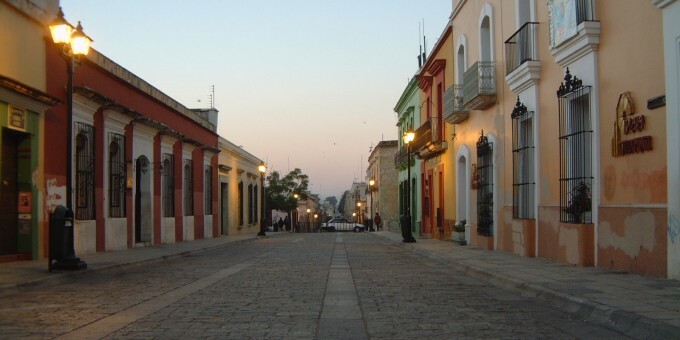 The city was nearly destroyed by an earthquake in 1854, and it wasn’t until the era of Porfirio Diaz that the city began to properly rebuild and start to grow again. Oaxaca hosts some of Mexico’s most vibrant natural terrain. From tropical forests, to high mountains, lush arable valleys, breathtaking rugged Pacific coasts, and quiet coves offering tranquil beaches with soft sands. Black clay pottery and textiles are famous handicrafts produced here. Both crafts are well-established locally, and Oaxaca pottery is especially well known and sought-after throughout Mexico, and world-wide. Oaxaca exhibits features that give this distinct location a mature character interlaced with a unique vibrancy—reasons why it is so highly spoken of by the people who know it. The eternal Mexico is embodied in Oaxaca: deep indigenous roots interweave with colonial flair, and the result is a cultural and historical vibrancy which is as emotive as it is unique. Oaxaca City offers a blend of experiences and attractions, including an engaging historical colonial center with cobbled streets, striking architecture, quiet plazas, and a fine central square often filled with soft sounds created by local musicians serenading people as they rest under the shade of its trees, as well as those taking some time to enjoy fine coffee and quiet conversation at one of the local cafés. Monte Albán, and Mitla, two of Mexico’s outstanding archaeological parks, are also near here; you can discover them through Mexperience guides. If you’re seeking to uncover the roots and the heart of Mexico, you’ll find them both in Oaxaca. This is a place to come when you’re hungry to explore the ‘undiscovered Mexico’, a region where friendly people, breath-taking architecture, a perfect climate, and delicious foods blend together to create an extraordinary cultural experience that is authentically Mexican. People who come to Oaxaca tend to keep coming back. Every time they return, they see something new in what they already know—and know that they’ll find something brand-new to experience as well. Ask any Mexican about Oaxaca and the first thing they’ll usually tell you is that it’s ‘the soul of Mexico’. It is true that Mexico’s roots and heart extend from here; but to understand why it’s called so, you’ll need to come and feel the atmosphere, smell the air, and absorb the culture. There is no other way to experience Oaxaca than to be here and know for yourself what it means to have been touched by its distinctive character. Oaxaca city is a well preserved, charming and vibrant colonial city. The city center has been restored in recent times. The city is host to some of the most important colonial buildings in Mexico and these are protected by INAH, the government body responsible for securing the country’s heritage. The center of town around the zocalo (Main Plaza) is completely closed off to traffic, and cafés and restaurants that surround the tree-lined square make a perfect setting for a relaxed drink or two while enjoying the warm sunshine and watching the world go by. The city’s Cathedral, which was finished in the 18th century is just north of the zocalo and features some stunning stone carvings on its front facade. The old Palacio de Gobierno (Government Palace) is on the south side of the zocalo and features some great architecture both inside and out. The seat of local government has moved out of the historic building to an out-of-town location. As a result the impressive palace is being converted into a museum and cultural center. To see a French-style indoor theatre, go to the Teatro Macedonio Alcala, built in 1903. You’ll find it on Av. 5 de Mayo and Independencia. The theater has seating for over 1,300 people on five tiers, and features an impressive marble staircase. One of Oaxaca’s most impressive-looking churches, and often seen in photographs promoting the city, is the Iglesia de Santo Domingo. The church was originally a Dominican Monastery; the internal decor is quite brilliant. In the evenings, the inside of the church is illuminated by soft candlelight. To see Oaxaca’s oldest church, you’ll need to walk about 2 blocks southwest of the zocalo and find the Iglesia de San Juan de Dios. This is a simple church, built around 1521, and is very popular with the local people. Oaxaca has many good museums, which is not surprising given the rich culture, history, and archaeology that Oaxaca has. A few of the main ones are listed here and you can get a complete listing from the local tourism office (see Practical Information). There are buses every quarter of an hour from Oaxaca’s second-class bus station to Santa Maria del Tule – Home to Mexico’s (and one of the world’s) oldest living trees, celebrating 2000 years and still growing. You can read about El Tule and see a picture gallery here. The tree is situated just 14 km (8 miles) away from Oaxaca City and makes an easy morning or afternoon trip. By Air – You can fly to Oaxaca from the US and and other points in Mexico including Mexico City, and some other smaller regional airports in the south of Mexico. The airport is on Oaxaca’s south side and it takes around 20-30 minutes to travel the 4 miles into the city center using ground transportation. Taxis, or for a cheaper ride, combis (mini vans) can take you into the city center. For detailed information about flights and flying, see the Mexperience guide to Air Travel in Mexico. By Bus – You can travel to Oaxaca on a luxury bus from Mexico City – the trip takes around 6 hours on the highway that connects Oaxaca City to Mexico’s capital. Buses depart from Mexico City’s eastern bus station (Central de Autobuses Oriente) and are frequent and plentiful, although prebooking is advised during Mexican Holiday periods (see Busy times in Oaxaca, below). For detailed information about bus transportation read the Mexperience guide to Bus Travel in Mexico. By Car – Driving to Oaxaca is very fast and efficient now with a high-speed toll road which leads directly to the colonial city from the nation’s capital. Take Highway 150 (Toll Road to Puebla) and keep going. The journey takes around 5 hours by car. See additional information about Driving in Mexico and Mexico’s Toll Roads on Mexperience. Major National Festivities are celebrated with vigor here, and Oaxaca becomes very busy during Easter Week, Guelaguetza (July) Day of Dead (November), and over Christmas. Guelaguetza: One of the biggest and most important festivls in Mexico is the Guelaguetza, a festival of colorful folk dancing and music which takes place here in Oaxaca around in July each year. For more details read Guelaguezta, Oaxaca on our blog. Book Ahead! If you plan to visit Oaxaca during one of the major festivals it’s advisable to book your transport and accommodations well in advance. Buses and flights book up and hotels sell out during the festive periods. Exchanging Currency: Banks with ATM machines can be found downtown, with a row of banks and exchange houses on a road off the south side of the main plaza. During business hours, they and the local Casas de Cambio will exchange your foreign currency. Read about money and currency exchange in Mexperience’s Money Section. Road Between Oaxaca City and Huatulco: Highway 175, which is the connecting road between Oaxaca City and Huatulco is remote, rugged and very mountainous (see driving to Huatulco in ‘getting there’). For security reasons, if you travel this road, whether by car or by bus, we recommend that you travel during daylight hours only. The best way to get Huatulco is by airplane from Mexico City or, in high season, direct from a connecting city in the USA. Internet Access: Internet cafes are commonplace in Mexico – new ones open and old ones close all the time – but you won’t have to look hard to find one downtown and in the main tourist areas. Busy Times in Oaxaca: During religious holidays (Christmas and Easter) and the Guelaguetza festival in July (see Local Events Calendar, above), Oaxaca becomes very busy as Mexicans go on holiday in the region and many Oaxaqueños return home to their families for the holidays. If your travel plans involve visiting this area during these times be sure to book ahead, especially your accommodation. Oaxaca has a selection of night spots to suit those looking for culture and those looking for a party. Locally Hosted Parties – Check with yours and other local hotels about public parties they may be hosting during your stay. Traditional Mexican theme night parties are popular with the locals, and there’s a chance you could join a really special night out – the real Mexican way, and certainly on the eve of September 16th – Mexico’s Independence Day. Hosted parties usually include dinner, dancing, a show and / or live music (usually authentic Mexican Mariachis) plus all drinks for a fixed fee and are always excellent value for money! Ask at your hotel to find out what is happening locally. Shopping for arts, crafts, textiles, pottery, and wood carvings in Oaxaca is a real treat. The selection is immense and the quality and value is unbeatable. Everything you buy in Oaxaca will be made in the surrounding towns and villages by artisans and crafts people living there. There are several markets in Oaxaca itself, as well as a plethora of craft shops and ambulant vendors. The main market in the city is the Central de Abastos— the big day is Saturday, although you’ll find activity there every day of the week. Monday: Miahuatlan for bread, leather and mezcal. Tuesday: Santa Ana del Valle for miscellaneous arts and crafts. Wednesday: Etla for flowers, cheese and meats. Thursday: Ejutla for textiles and mezcal. Friday: Ocotlan for flowers, textiles, and pottery. Saturday: Oaxaca at the Central de Abastos (see above). Sunday: Tlacolula for rugs and ceramics; and Tlaxiaco for blankets and leather jackets. Oaxaca enjoys year-round, warm and dry weather (hot and humid on/near the coasts). The climate is ideal for taking part in a variety of outdoor activities and for taking in the local culture, architecture, and scenery. Rains are seldom a feature here; when they do come they tend to be during the months of April thru November, but as with most monsoon areas, rains tend to be fierce and brief in the late afternoon, leaving the evenings dry and cooled off.